The Roofing Doctor is a professionally licensed contractor for both Massachusetts and Rhode Island, dedicated to serving homeowners and commercial enterprises in both states with a business location in each. We know customers prefer to deal with a locally-owned company with a proven track record of quality developed over years of service. A service warranty will not be worth much, should your roofing company go out-of-business. We also do our part for the local economy by acquiring most of our roofing and other home improvement materials from companies that create jobs right here in New England. Our Massachusetts office has a display center with products for your home including roofing samples and colors, gutters, leaf guards and siding. 2603 GAR Highway Swansea, MA. Our Swansea, MA location is centrally located with easy highway access for dispaching our roofers with whatever material is required for your roofing project. We travel to towns like Franklin, Sharon, Norton Center, Walpole, Marion and Mattapoisett MA. We also meet Massachusetts' regulations, requiring those doing roof replacement, home siding, or window replacements to hold both a Home Improvement Registration and a Construction Supervisor's License. Here, you'll find our Massachusetts Contractor License numbers listed. We began our operations in Barrington, RI over two decades ago. Since that time, we have covered many landmarks in the area with new roofs. It's no surprise then, that you so often see 'Roofing Doctor Signs' outside many of the finest New England homes, while the roofing project is underway. 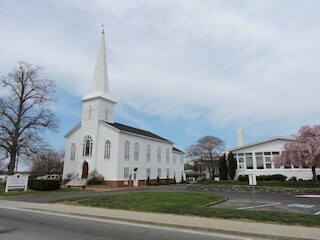 Barrington Congregational Church re-roofed by the Roofing Doctor.